Jesse Eisenberg has been on a bit of a hot streak recently. From The Squid and the Whale to last year’s Adventureland and Zombieland, he’s a surefire hit for a good indie comedy. 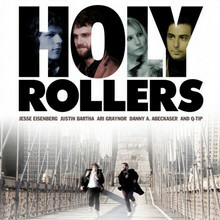 Holy Rollers is but a minor hiccup in a building career. While it’s story is interesting and the acting good, it goes by without much tension and lacking that certain spark. It’s worth a peek if you don’t have high expectations. Based on a true story, Eisenberg plays Sam, the eldest son in a Hasidic Jewish family living in Brooklyn in the late 1990s. Growing up in a tight community, he has his future pretty much planned out. Or, his father and the rabbi do. He’s content to marry a neighboring girl, work in his father’s garment shop and study to become a babbi. That is until small cracks start to break in the plan. As reality doesn’t meet his expectations, he’s given a proposal to make a lot of cash from his neighbor Yosef (Justin Bartha). Yosef is part of an ecstasy smuggling business through Amsterdam that uses Hasidic Jewish kids as the unassuming mules. Like Sam, however, they all think they’re smuggling “medicine.” But as Sam sees his home life stalling, he’s slowly drawn in and soon becomes an asset to the organization. On paper it sounds like a truly intriguing story, especially because it’s true. But fist-time director Kevin Ansch and writer Antonio Macia never inject enough tension and it just glides by in one long movement. Sam’s character is left flat and attempts to make him a “real” person don’t take. Yet, the story itself is interesting enough to hold you over and the acting is credible. Only it’s not Eisenberg who’s the star but Bartha as Yosef. Yosef is a destructive man. Completely lost and cut off from his community and family, he gets deeper and deeper not only in the game but in the product too. He pops up as the cool guy who was able to get out of their small world. He’s soon the pathetic friend who’s done too many drugs and made bad choices. Bartha plays both sides with surprising gusto. He may have been the absent friend in The Hangover but here he really proves that he has talent. This is a film that had a lot going for it but just didn’t quite make it on screen. Still the talent involved is mostly top notch and the results are mildly entertaining.